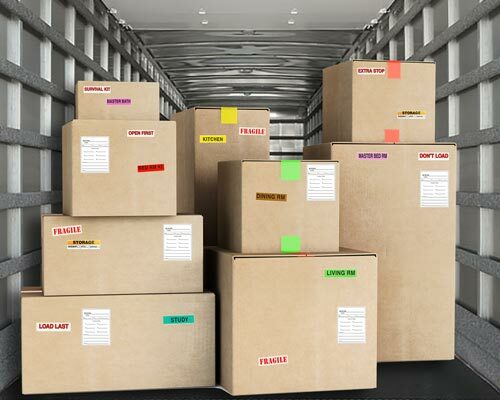 Tag-A-Room is the original creator of the color coded moving and storage label systems. Tag-A-Room was created over 30 years ago by the owner of a small moving company in San Antonio, Texas, to differentiate his company from other moving companies. He used labels to organize the boxes and furniture throughout the move process, thus reducing the chance of having mismarked, misplaced boxes which resulted in customers’ saving of time and money. There was no more asking “Where does it go?”. 30 years later, Tag-A-Room has grown into its own company serving customers nationwide with hundreds of line items. Tag-A-Room provides “Moving and Storage Solutions” to various clients that include: move managers, moving companies, mortgage companies, realtors, retail outlets, and of course our original customer “the end user”. Our products are unique and cost effective, but most importantly they help relieve some of the stress associated with moving, by providing a smooth more organized move experience. Tag-A-Room is committed to providing our customers with extraordinary products, value, service. We strive to provide a seamless, satisfying shopping experience for all our customers by, listening to their needs, evaluating the feedback, and ongoing process development. You can contact our dedicated Walmart support team at walmartsupport@tagaroom.com for an email response with 1 business day. If you need to reach us by phone, please contact us during customer service hours: Mon – Fri 9:00 am – 5:00 pm Central Standard Time. Tag-A-Room’s shipping policy includes: We ship next business day following the receipt of order. We ship within the Continental U.S. only and cannot accommodate orders to Alaska, Hawaii, U.S. Protectorates, and to APO/FPO destinations. We also do not ship to P.O. Boxes. Estimated delivery time is 3-5 business days. We are not responsible for weather delays or any unforeseen carrier delays. Returns may be made within 30 days of order. Returns must be in original package and must be complete. Any product received in error or damaged must be reported with 7 days of receipt. Returns made by customer that are not the fault of the seller will be made at customers expense. Returns may incur a 15% restocking fee. WE CHARGE SALES TAX IN THOSE STATES WHERE WE HAVE A PHYSICAL OR ECONOMIC NEXUS.